The work group Â“Solar Cookers SliedrechtÂ” provides free advice about producing and introducing the Dierkx type box cooker for cooking by sunrays. During its starting period the work group produced over 150 cookers in order to prove that cooking by sunrays would be possible. 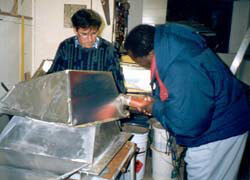 Since that time lots of experiments have been done and several projects with the cooker are going on now. During this process an enormous amount of knowledge has been acquired. Apart from the Parabole Cooker and the Cookit the work group thinks cooking by sunrays with the Dierkx type Box Cooker (with its slanting window) the best way in most cases. Further information about our projects and financial possibilities. Different types of solar cookers. The type of solar cooker used by us. Directions for using the solar cooker. 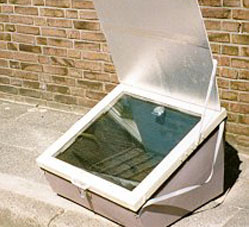 A double solar cooker tested in the Netherlands. 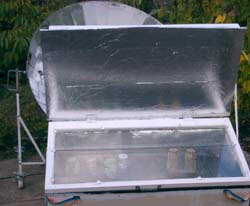 A number of things which may be important when introducing a solar cooker. The boxcooker type Dierkx in action. The double boxcooker in the full sun. Het folding device in action.